Posted On June 22, 2017 by Team iCynosure. As a woman working in a professional, business environment, you should know this; before you really speak anything, it’s your appearance and the way you carry yourself that makes a mark on the other person. No matter if it’s your own co-workers, your bosses or your client; how you present yourself reflects on your work ethic, professionalism, and capability. No one wants to work with a person who can’t take 15 minutes to dress properly. However, you don’t want to look overwhelming and overdressed. Dressing up for work can be really tricky; there’s a very fine line between dressing smartly and taking it to an unrequited level. You want to keep it minimalist and simple yet elegant and powerful. And if you’re a person who has to deal with clients and people one-on-one, you need to look your best as you are the one representing your firm. Also, keeping in mind that you are going to be working some 10-odd hours, you need to dress up in clothes that you can be comfortable in all throughout the day. Clothes that should in no way hinder your working capability or affect your calibre. 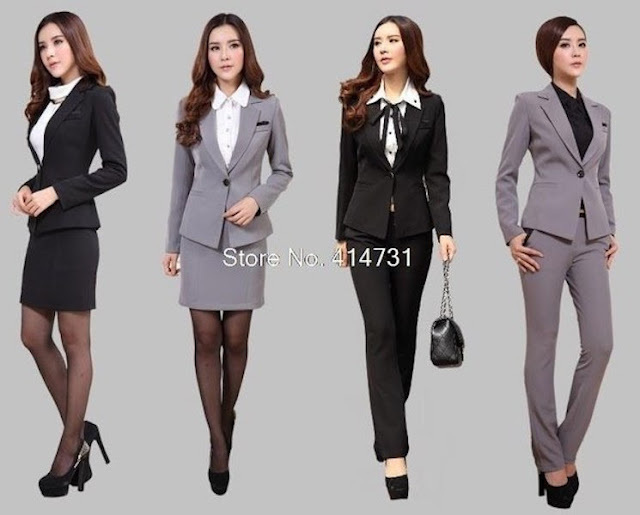 Pant-suits, pencil skirts and blouses, trousers and shirts and formal dresses are a popular bet among women when it comes to dressing for a business meeting. However, nothing speaks power and authority than a pair of well-fitted trousers, a crisply starched shirt, and a complimenting jacket. Yes, a pair of well-fitted trousers, a crisply starched shirt, and a jacket is the best possible attire than speaks power and lets people know who’s in charge. It is super comfortable and available in materials that let your skin breathe the most. This is one look that does not even take 5 minutes to throw around and will bask in the most compliments for you. Slip on a pair of nice pumps, put on a string of pearls, get minimal makeup, put your hair in a bun or a ponytail and that’s it! Get an oversized bag, a statement watch and giant pair of sunglasses to complete the look. Pants and trousers can be tailored to suit your preference. They are already available in so many different styles that you are spoilt for choice. You have the boot-legged pants, wide-legged trousers, well-fitted pants and even flared pants. Best colours to stock up on are dark grey, steel grey, black, and ash colour. Plus, trousers have pockets! Women know the joy of wearing clothes that have pockets. When it comes to shirts, sticking to monochromes, hues of black and grey does wonders. However, you can always play around with a little light pink, powder blue or the lightest of yellows. Not only will it bring in some colour, but will also look more feminine. Besides, you can always ditch the cotton starched shirt and choose to wear silk blouses or silk buttoned-down shirts to pronounce that elegance. The jacket or the blazer is the most powerful ensemble. Choose a well-tailored jacket that enhances your curves and brings out your feminine side. You can always choose from denser materials to softer ones.